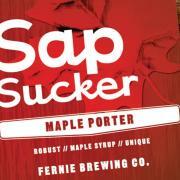 FERNIE, BC – Fernie Brewing Co. has a new seasonal brew out this week, Sap Sucker Maple Porter. It’s a deliciously dark and robust Porter, with a delicate but flavourful touch of maple syrup. With few other maple products on the market and with the popularity of our existing dark beer, our Fernie First Trax Brown Ale, our new Sap Sucker Maple Porter we hope will develop into another strong and distinctive FBC product on the shelves. Sap Sucker is available now in 650 ml bottles in liquor and beer stores across BC.